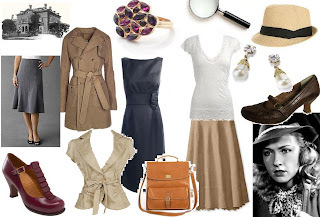 First off, I will give examples of what Nancy would wear in the original books c.1930s -1940s. I'll also share Nancy's style in the old black & white movies with Bonita Granvielle. If you have never seen the old Nancy Drew movies with Bonita Granvielle, may I highly recommend them to you! True, they are not like the books, but they hold the spirit of Nancy Drew and they are clean family-friendly movies. You can watch and download Nancy Drew: Reporter at Internet Archive, as it is in the public domain. The other Nancy Drew movies can be seen sometimes on TCM, or you can buy them on DVD. The above sets show some examples on how you can dress Drew's style today. Wear classic looking skirts with blouses or nicer type of shirts. Do pair it with kitten heels and a nice cloche. As Nancy would surely approve. In the movies Nancy wore blouses with bows, skirts, dresses, full slacks, fedoras, wedges, cardigans, and jackets. All in all, Nancy has a very classic look. The two sets above I made on Powerpoint last year. These capture more Nancy's style in the movies, then the books. Thank you, thank you, thank you! I love this literary heroine and her style! Did I say, thank you? I love Nancy Drew style! haven't seen the movies - but I love the clothes! What great retro inspiration! I really like the styles you have here. I'm quite pleasantly surprised by them. . . and inspired to incorporate some of the look into my own wardrobe. Wow! Love this! Thanks so-o-o much! I have always been a huge fan of Nancy Drew, and her style. One idea, try doing a post of the outfits in the 2007 movie! She has awesome coats and dresses in that movie. In a way, Nancy's style kinda reminds me of your style! I love your style! it's just AMAZING!